AFTER my car blew up, I bought a cheap one from some young people to run for a few months till I could afford a good car again. But the bumpers on the cheap car were broken and just about falling off, and the glass had fallen out of the passenger side mirror as well. 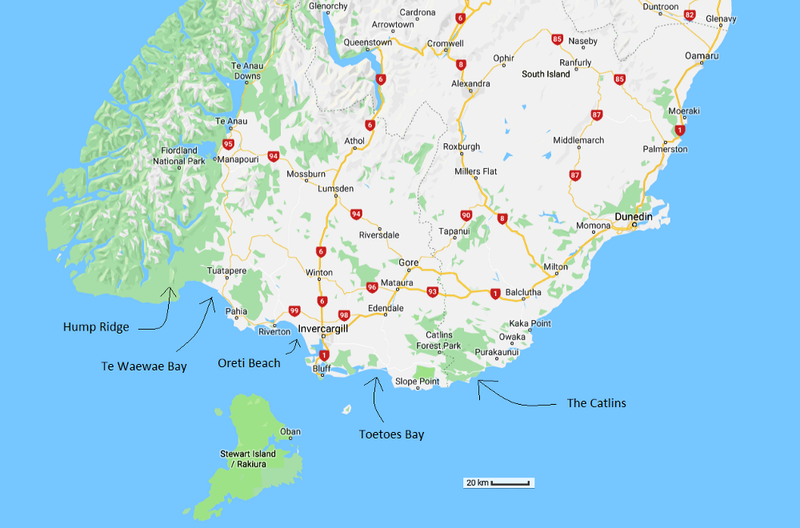 So, I figured I needed to drive to Invercargill, the nearest large city to Queenstown and the southernmost city in New Zealand, known as ‘Invers’ to the locals, to get the relevant bits and pieces. 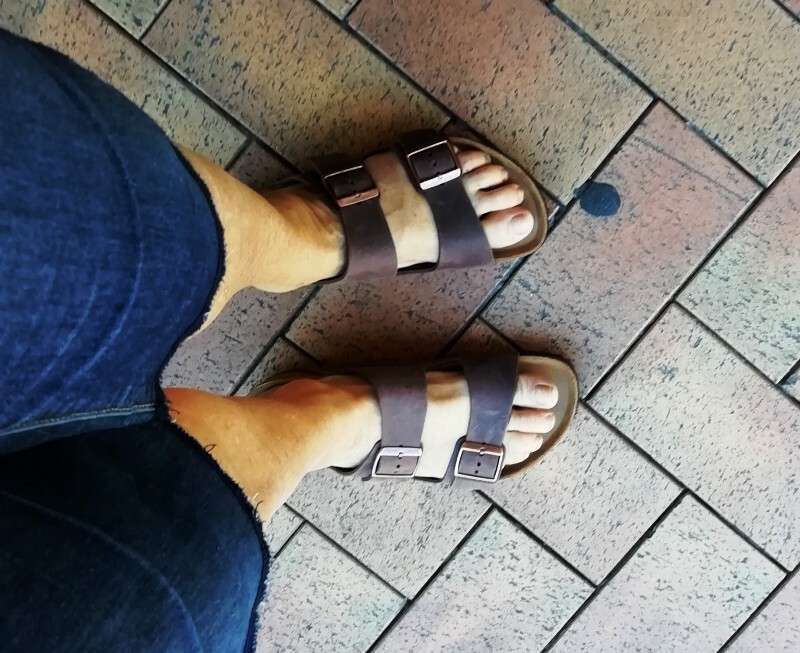 I also wanted to do some shopping for good sandals and get a pedicure for my bunioned feet, as Queenstown is notoriously expensive for that sort of thing. 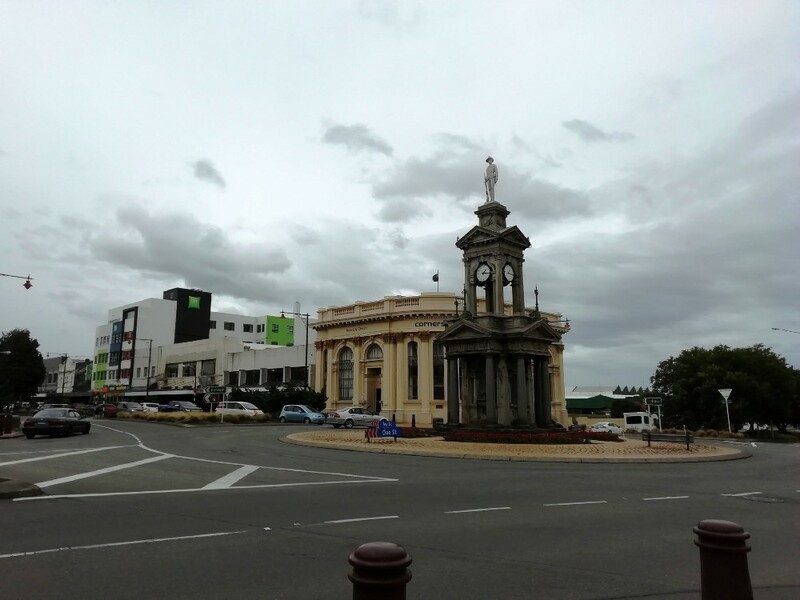 I travelled to Invercargill by driving south from Queenstown on State Highway 6. State Highway 1 continues southward to Bluff. I’ve added the names of some other local attractions that I’ll talk about below. Map data ©2019 Google. I set off on the 18th of January, which is high summer here. The day was gloriously warm. 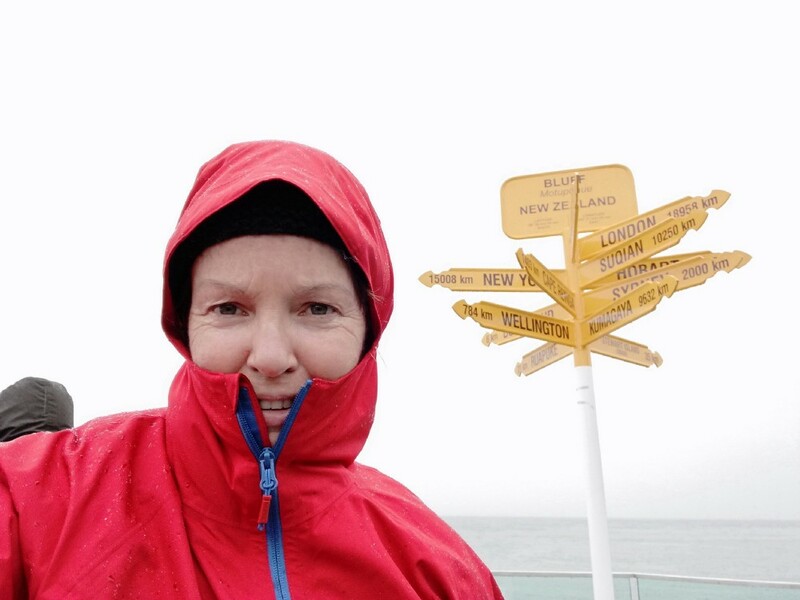 But the next two days became wrap-up days, as they often are at the south end of New Zealand even in summer. Up to now, Invercargill has been overshadowed by flashier and more adventuresome tourist destinations like Queenstown, famous for things like bungy-jumping and skiing as well as the undoubted charms of Lake Wakatipu. But Queenstown seems to be full up, and overpriced. Many backpackers and freedom campers are also being driven out of Queenstown and its restrictive environs. 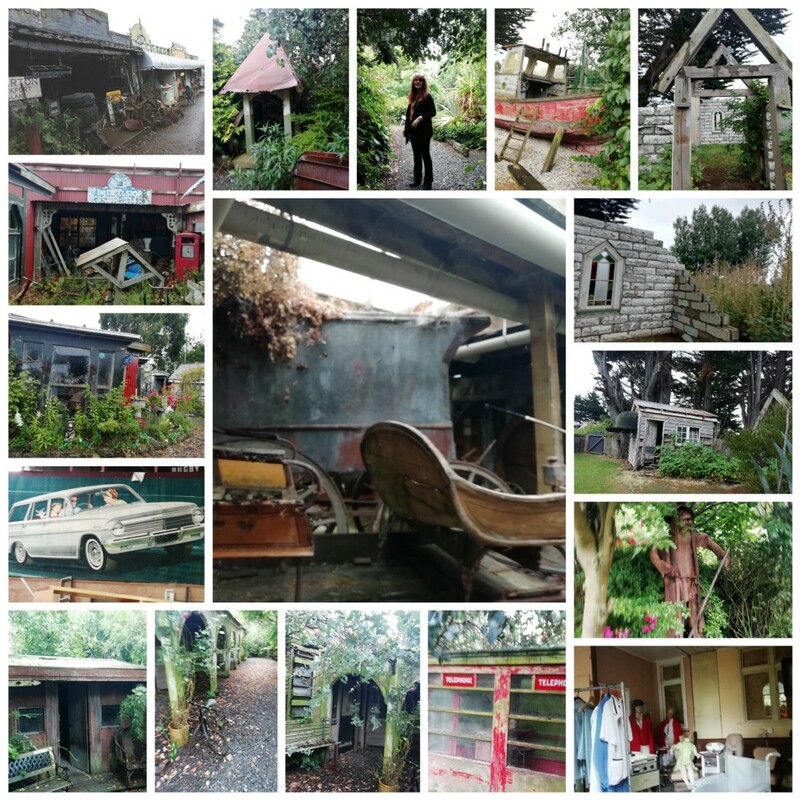 The fortunes of old-fashioned and off-the-beaten-track places like Invercargill often improve when people get tired of the Queenstowns of this world, and go looking for a more relaxing sort of holiday. Invercargill might not do bungy jumping and skiing, but it’s still the gateway to the wilderness of southern Fiordland where the Hump Ridge Track is located; the coastal wilderness of the Catlins east of the city; the lengthy beaches of 26-km long Oreti Beach where Burt Munro used to race ‘The World’s Fastest Indian’ and the similarly lengthy beaches of Te Waewae Bayand Toetoes Bay; the town of Bluff (most southerly on the New Zealand mainland); Slope Point, the southernmost point on the South Island; and Stewart Island/Rakiura further to the south, a large island that is now one of a handful of international Dark Sky Sanctuaries. Satellite image of Invercargill and Bluff and the coast to the west, showing Hump Ridge (brown) just west-northwest of Te Waewae Bay, and Oreti Beach between Riverton and Invercargill. The beaches are clearly visible even though they are well over 25 km long. Imagery ©2019 TerraMetrics, Map data ©2019 Google. 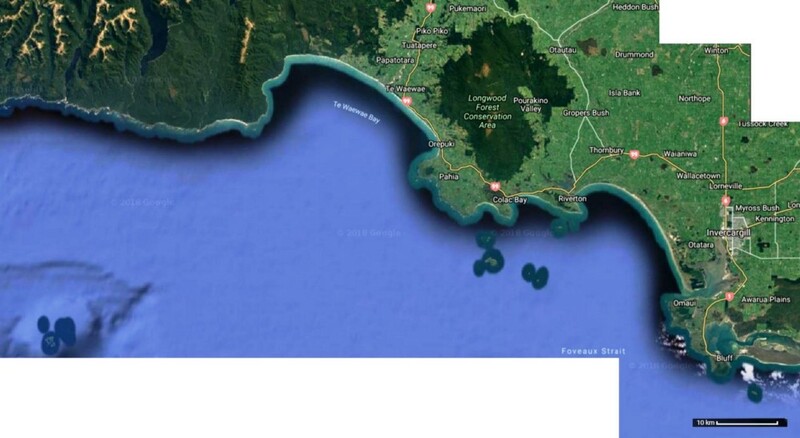 Satellite image of Invercargill and Bluff and the coast to the east, with Toetoes Bay, the third giant beach in this area, to the east of Bluff, past Fortrose. 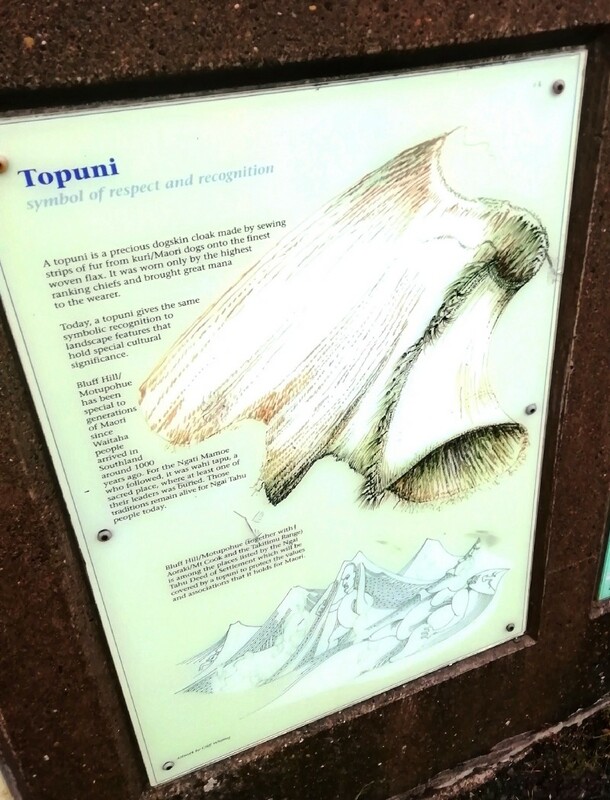 Note also the lengthy dotted north-south trail through Slopedown, Catlins Forest Park and Progress Valley to the sea. Imagery ©2019 TerraMetrics, Map data ©2019 Google. 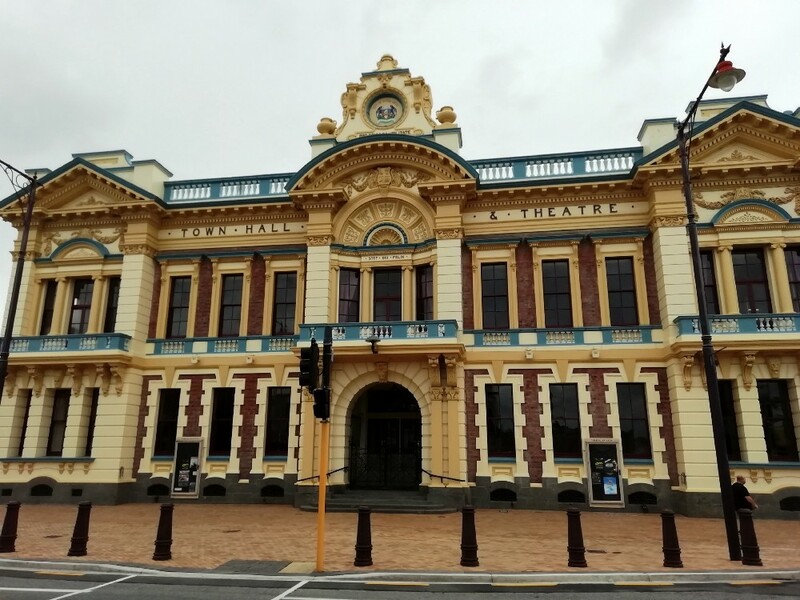 Invercargill also has a lot of beautiful old buildings and parklands, which I’ve written about in an earlier post. The large, classy Queens Park joins on to a so-called Town Belt of parkland that encompasses the inner city. The Town Belt is shaped like a trident with Otepuni Gardens, through which flows the Otepuni Stream, as the middle prong. The downtown area is thus divided up into two precincts in an arrangement very similar to the Adelaide Park Lands, except that in the case of Invercargill, the railway yards and the industrial district of West Invercargill (probably still a swamp in the 1800s) form the western side of the downtown precinct. A satellite view showing most of Invercargill. The name of Queens Park has been added. 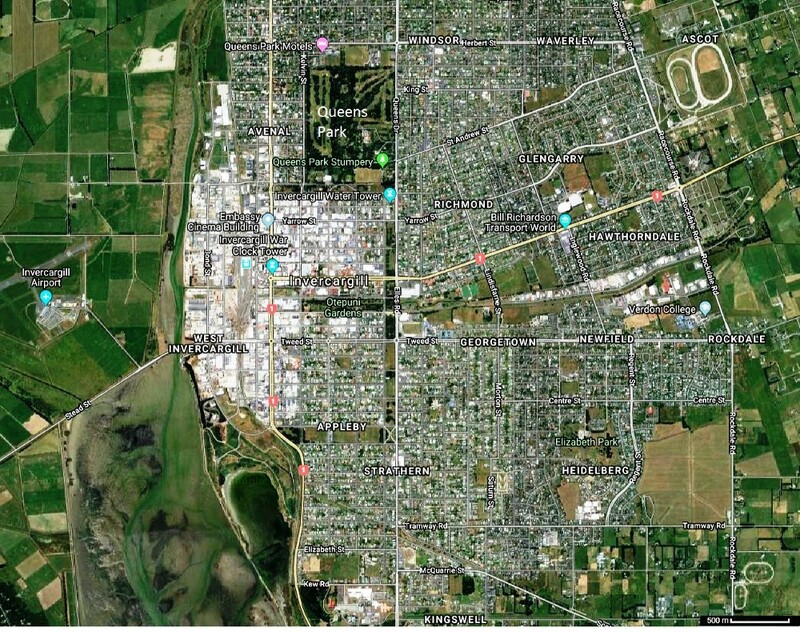 Clearly visible also is the Invercargill Town Belt (of parkland) which forms three sides of a box south of Queens Park, west of Elles Road and around into Appleby plus Otepuni Gardens. 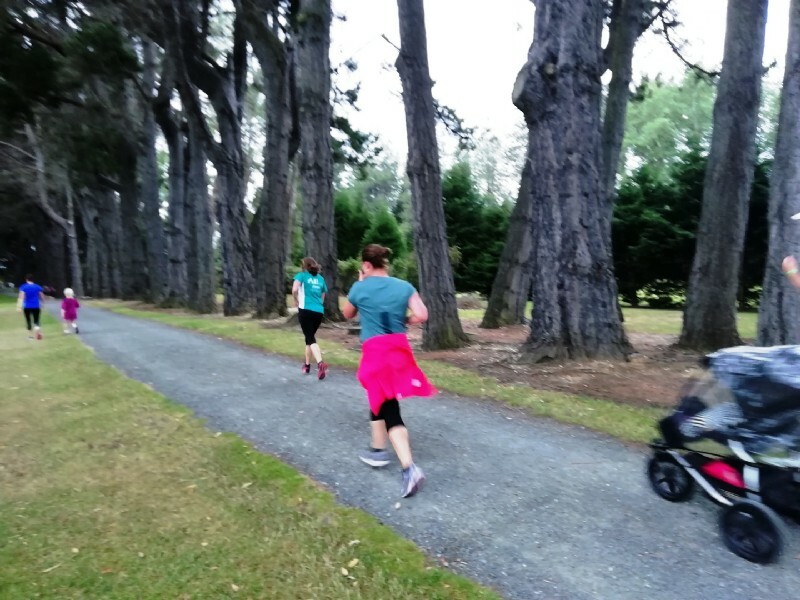 There is also a significant suburban extension of the downtown parklands further up the Otepuni Stream, beyond Elles Road, between Richmond and Georgetown. Imagery ©2019 CNES/Airbus, DigitalGlobe, Landsat/Copernicus, Map data ©2019 Google. Such encompassing parklands were a common thing in colonial New Zealand and in some towns and cities in Australia too, such as Adelaide. Here’s a more detailed aerial photo of a part of the central area, followed by a historical photo and some photos of my own taken inside areas highlighted with yellow ellipses. You can see the Otepuni Gardens and stream in this aerial photo, as well. Downtown Invercargill with yellow ellipses around features in photos following: The Crescent, the South African War Memorial (“Invercargill War Clock Tower”), the old Bank of New South Wales on the corner of Dee and Tay Streets, and the Civic Theatre and old town hall further east on Tay Street. Part of Otepuni Gardnens is prominent toward the bottom. Name of Tay Street added. Imagery ©2019 CNES/Airbus, DigitalGlobe, Map data ©2019 Google, MapData Sciences Pty Ltd, PSMA. Invercargill South African War Memorial (completed in 1908) with later clocks, with Tay Street behind and Dee Street left foreground. The Crescent continues Tay Street on the other side of the memorial. The street at far right is Clyde Street: as in Dunedin, a certain Scottish theme starts to become apparent, once more. 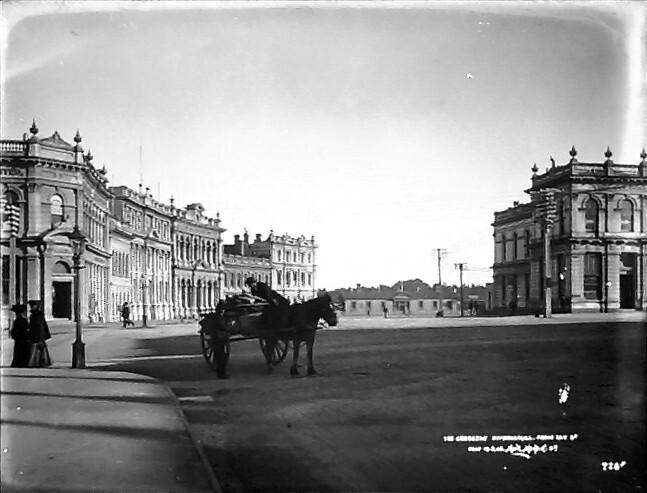 The Crescent from Tay Street, circa 1905. Invercargill’s South African War Memorial would soon occupy the middle of the plaza shown here. Image by Muir & Moodie studio, courtesy of Te Papa, collection number C.012926. 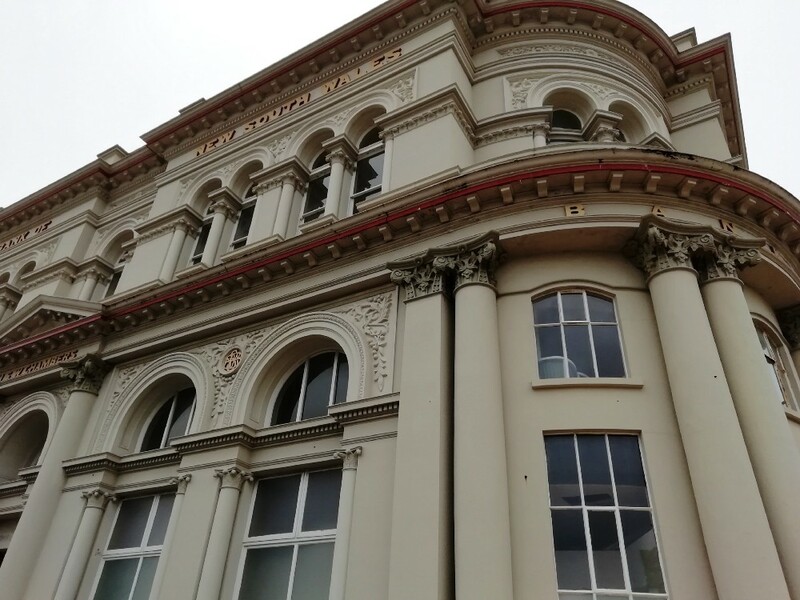 All in all, old colonial cities like Invercargill (and Adelaide) often have a lot of character and public amenity, and need to be kept that way. On the other hand, anything to do with petrol and motor racing is a big thing in Invercargill, thanks to the influence of people like Burt Munro no doubt. Or to put it another way, Burt Munro didn’t race up and down Oreti Beach all by himself. I went to Teretonga Park, the home of (non-beach) motor racing in invercargill and its surrounding region, which is known as Southland. 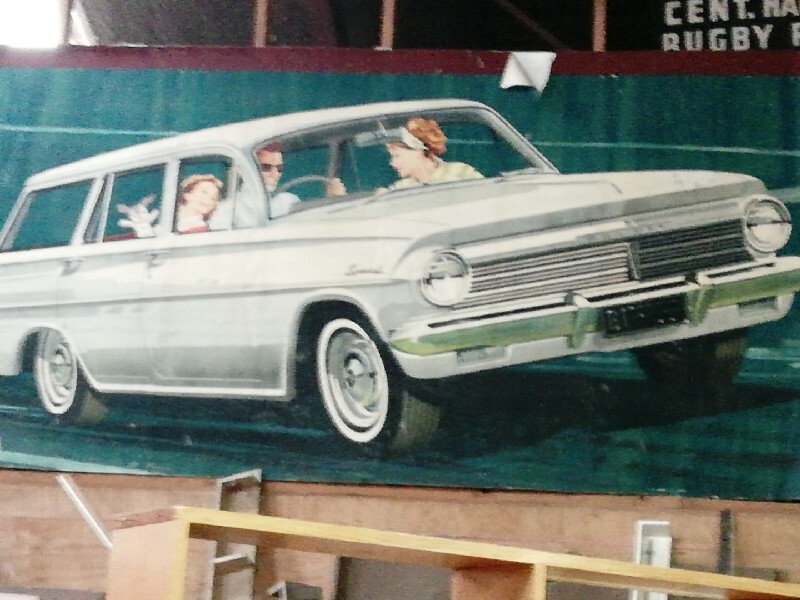 There’s also Transport World, an absolutely world-class double transport museum founded by the late H W [Bill] Richardson, a prominent Invercargill trucking company proprietor and obviously passionate enthusiast for anything that ran on rubber; one of those people who had Diesel for blood, as you might say. Bill Richardson’s company now has the more corporate-sounding name of HWR and has, indeed, since diversified into real estate. More on that later. There are two individual museums on the Transport World site, Bill Richardson Transport World, which bills itself as “the largest private automotive museum of its type in the world,” and Classic Motorcycle Mecca, which claims to be “Australasia’s premiere motorcycle museum.” To call something Mecca might not be regarded as too woke in a more cosmopolitan sort of a city — one or two Auckland cafes had to drop that name — but then again Invercargill really is a wind-your-watch-back-thirty-years sort of a place. Which raises an interesting point. Invercargill has started to change since I was there last. Tourism is up in Invercargill (as is homelessness); and Airbnb is catching on too, though it’s not yet expensive. I got a palace for only NZ $30, or about US $20. This is a lot cheaper and better than staying at a backpackers. The Southland Museum and Art Gallery in Queens Park has closed due to earthquake risk, pending redevelopment. 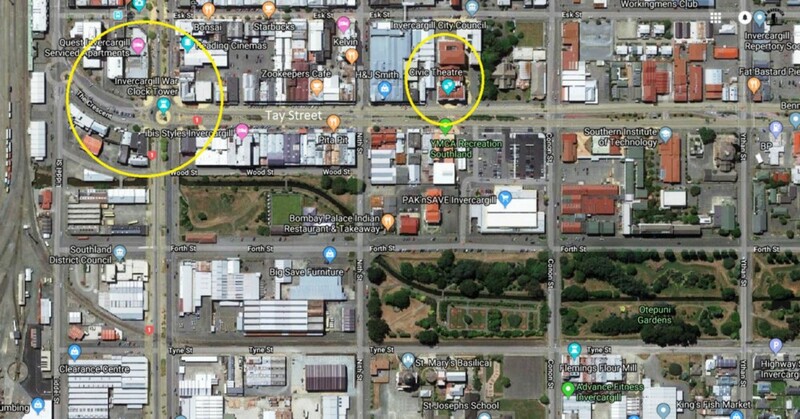 And earthquake risk, and the cost of refurbishment, is also being used as a pretext to demolish almost the whole of Invercargill’s oldest and most historic city block, between Tay, Dee, Esk and Kelvin Streets, across the way from the Crescent and the South African War Memorial. Here’s a video of me walking around the area and looking at the frontages. The buildings across the road that I wonder about at the end, are safe. It was on Saturday the 19th, when I was shopping for sandals, getting a pedicure and looking for car parts, that the locals I ran into told me about their ‘crazy’ council-sponsored redevelopment scheme. 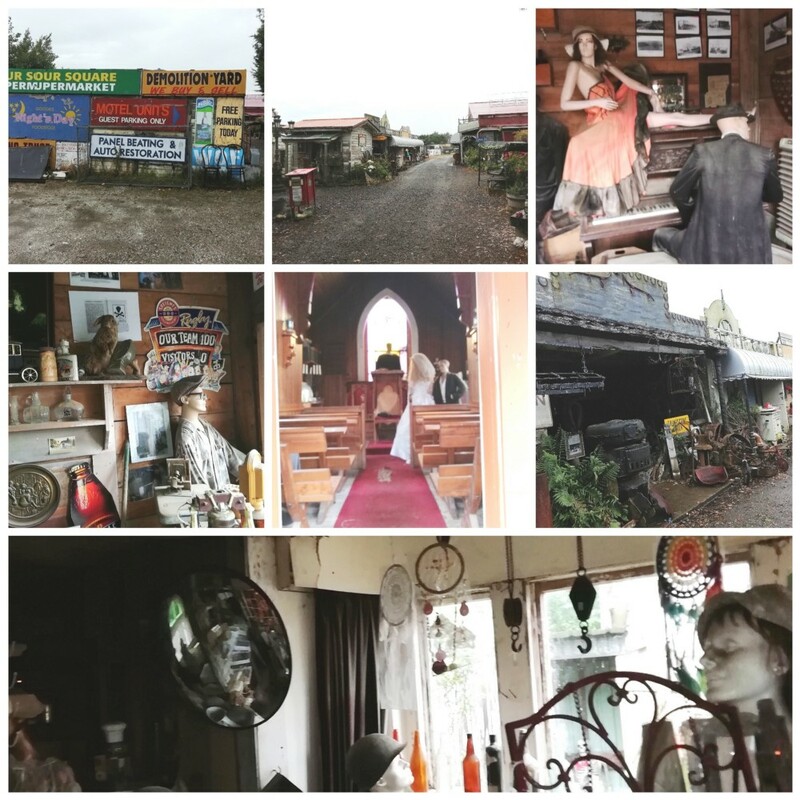 Like just about everyone who isn’t from Invercargill, I’d heard or noticed nothing about it till I went there and met local people, It’s amazing how much can go on in a town without anybody who doesn’t actually live there ever finding out about it, even in the modern information age. 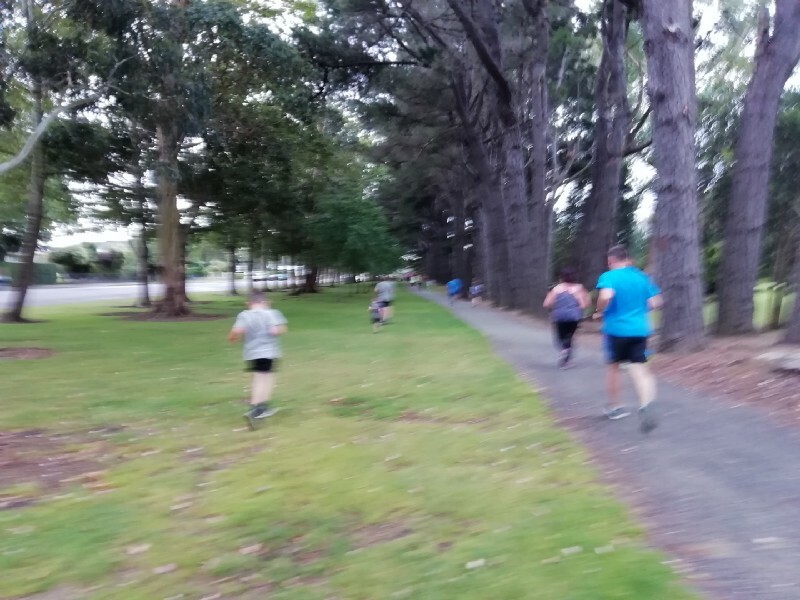 On the Saturday, I also managed to make enough time to get to Queens Park, where I caught up with about 100 runners from a club called Invercargill Parkrun. This seems to be an arrangement whereby busy people work towards a competitive race around the park once a month. 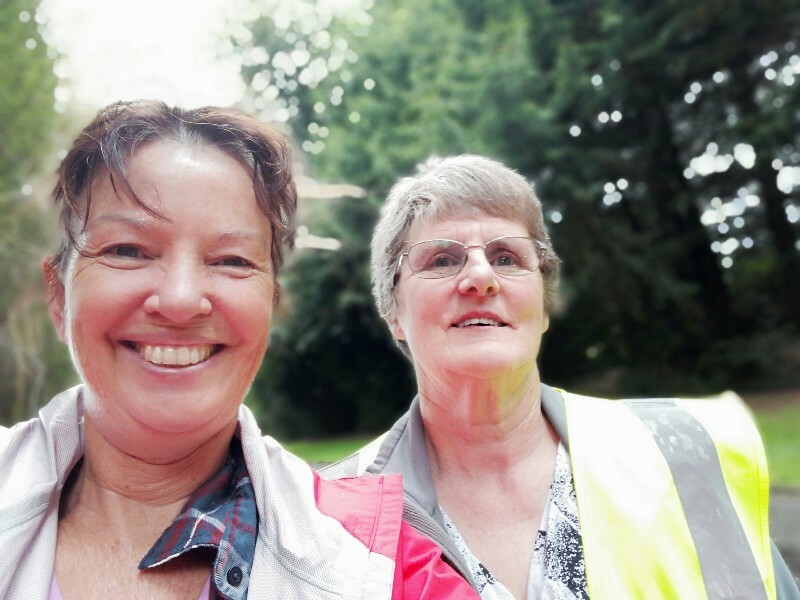 I met a woman who was a marshal, guiding the direction of the run. We spoke for 20 minutes. Her name was Marie and I found that I had met her socially eight years before, a friend of a friend. Her husband Ant was also a Facebook friend of mine, as it turned out. 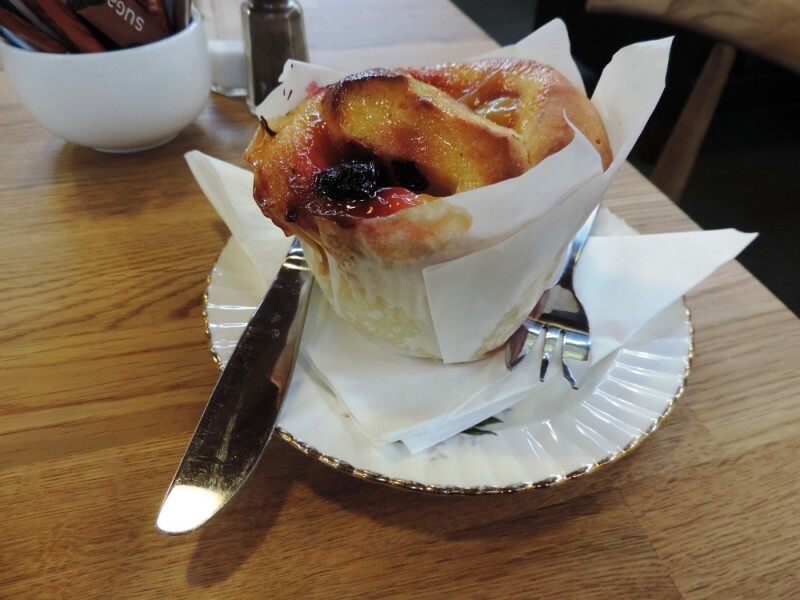 We ended up going to the park’s gilt-edged-service café, the Cheeky Llama, and talking more about the redevelopment scheme and other things. The next day, my search for a second-hand bumpers led to a place called Demolition World, run by another woman named Leigh, which turned out to have nothing to do with car parts at all. 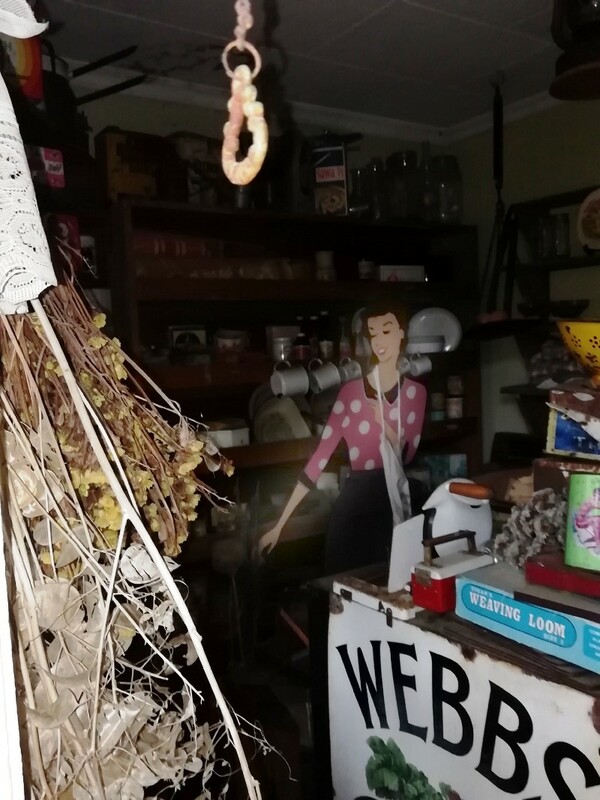 Instead, it was a re-created town made up of bric-a-brac from the colonial era to the 1960s, stuff that Leigh saved while onselling more valuable recycling materials, timber mostly. One of the old signs outside the front entrance promised panel-beating services, so I thought it must be an auto junk yard. It turned out that it was just a sign and that Leigh was a sign collector. I was so astounded. Demolition World has 50 shops which recreate the past, a church where people are getting married in the old style; a bar with old style bottled beer; a ‘dairy’ (NZ expression) or corner shop from the fifties with 1950s containers for the products; a circus; a shop with old toys; a blacksmith’s shop; a railway station; and old horse-cart; and an old medical centre. It’s a work of art. Leigh, who has seven children, doesn’t charge other than a ‘gold coin’ donation (meaning $1 or $2, not real gold). Then, finally, I went off to Bluff to climb the Bluff Hill and take some more photos. 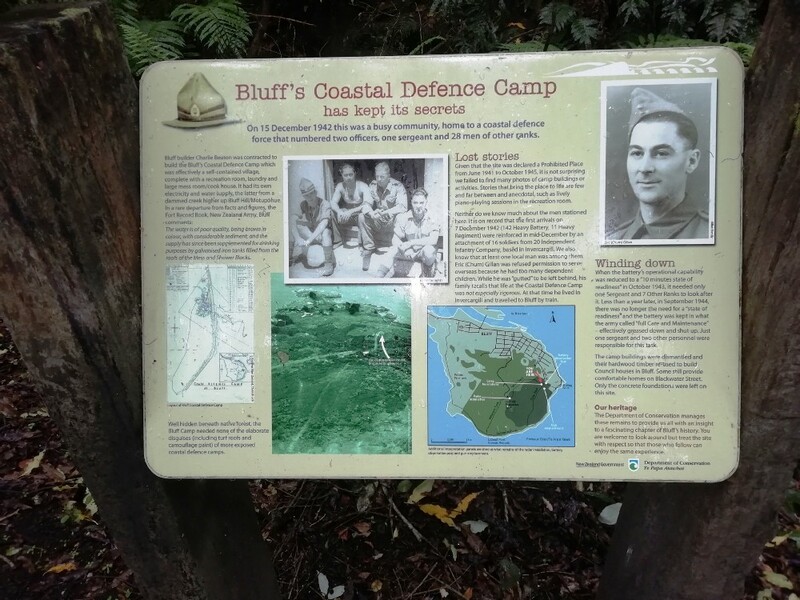 Though isolated and remote even by New Zealand standards, and completely at the wrong end of the country as far as the rest of the world is concerned, Bluff is nevertheless a surprisingly important port. 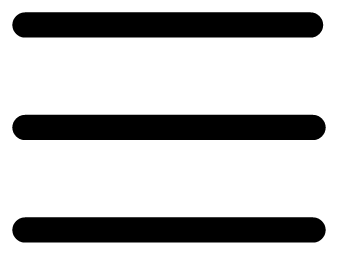 Part of the reason for this is that it serves the Tiwai Point aluminium smelter, a plant that uses cheap, possibly undervalued, hydroelectric power to smelt some of the world’s purest aluminium. Tiwai Point was commissioned in 1971. I think in those days the politicians had a vision of New Zealand as the Sweden or Switzerland of the South Pacific, making expensive added-value products such as racing bike components out of the aluminium. But these days, 90% of it is exported as ingots. 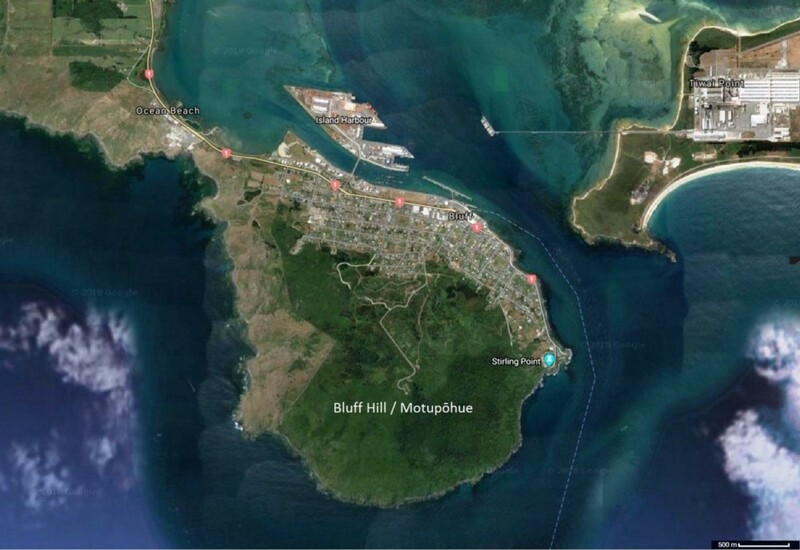 Bluff Hill is officially Bluff Hill / Motupōhue, the island of vines. It isn’t quite an island, as you can see. Bluff and the natural harbour of Awarua Bay, plus a part of the amazing beach of Toetoes Bay. The Tiwai Point aluminium smelter lies just across the harbour entrance from Bluff. Imagery ©TerraMetrics, Map data ©2019 Google. A closer aerial view of Bluff and its significant harbour works. Names of the hill added. Imagery ©TerraMetrics, Map data ©2019 Google. There’s a link to the walks on Bluff Hill here. By the time I got to Bluff the January weather had turned into the opposite of summer, as it often does in these parts, which lie in the latitude of Patagonia and face south toward Antarctica. Here I am beside a famous sign. 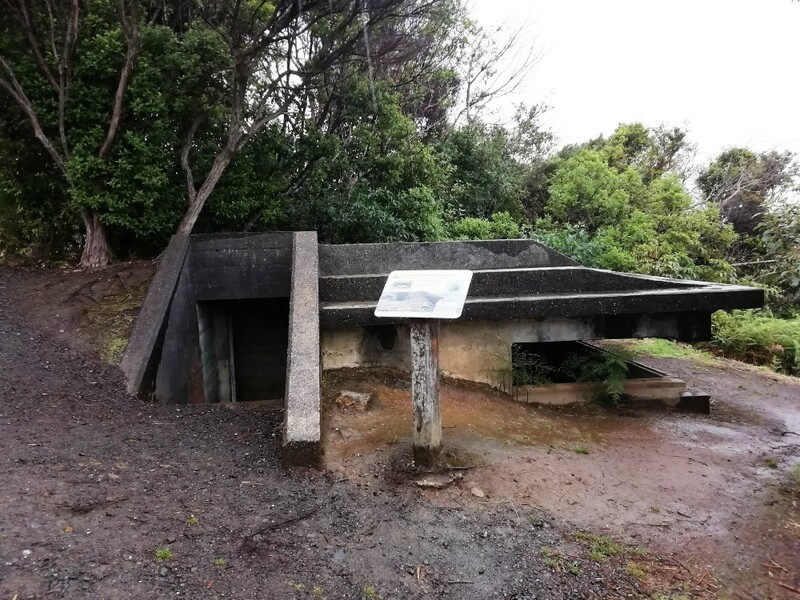 There’s an old gun emplacement on the hill, created just in case anyone ever tried to attack the most southerly major port in the British Empire (they didn’t). There’s also some significant Māori culture on the island of vines. 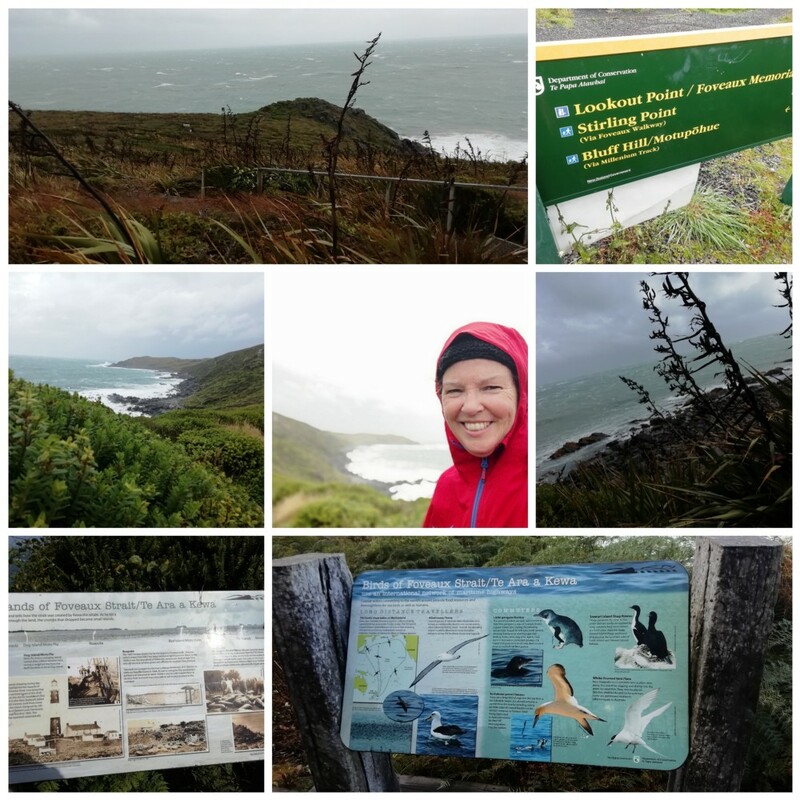 Although South Island Māori faced a harsher environment and were fewer in number than in the North Island, this area is known for its fat juvenile seabirds, known as tītī or muttonbirds, which would be regularly harvested and preserved and thus helped to sustain human life. Finally, this is me trying to narrate a video about the view down to the town of Bluff and the Tiwai Point aluminium smelter. Bluff Hill / Motupōhue with wind noise! But do come to Bluff — it’s so bracing!